La Cascade de Gavarnie was certainly one of the more well-documented waterfalls in France. 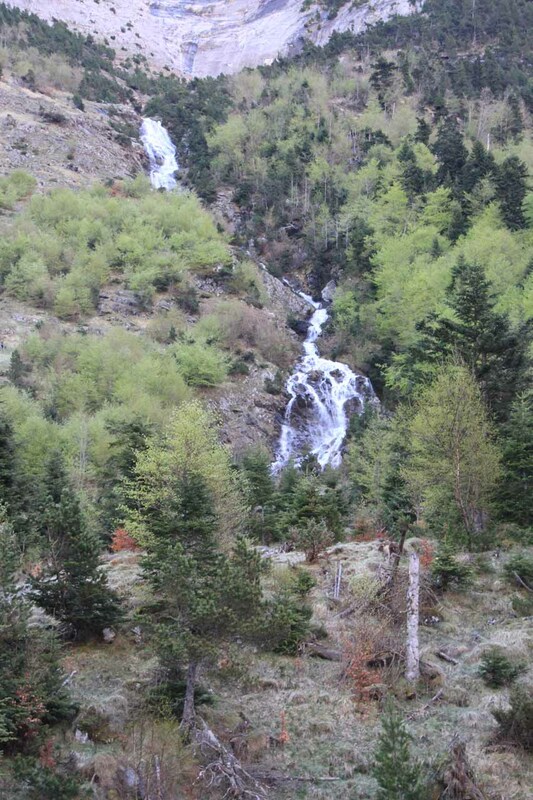 This was notable because from what we could tell in our research prior and during our trip, waterfalls in France in general weren’t generally talked about outside of the local French literature. 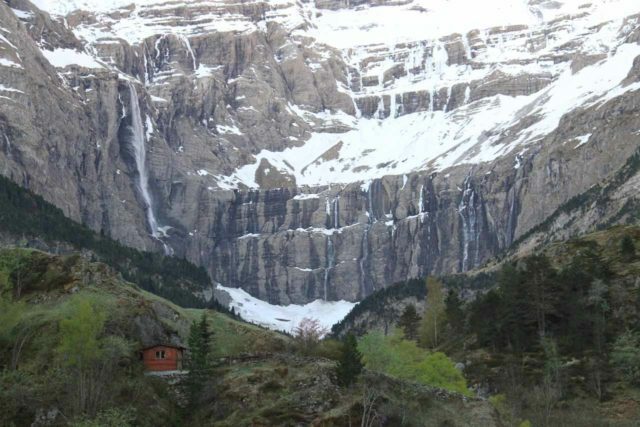 So for this reason, I’ve seen this waterfall referred to as: Gavarnie Falls, the Gavarnie Waterfall, La Grande Cascade de Gavarnie, or even La Cascade du Gavarnie (where they include the definite article for “The Gavarnie”). 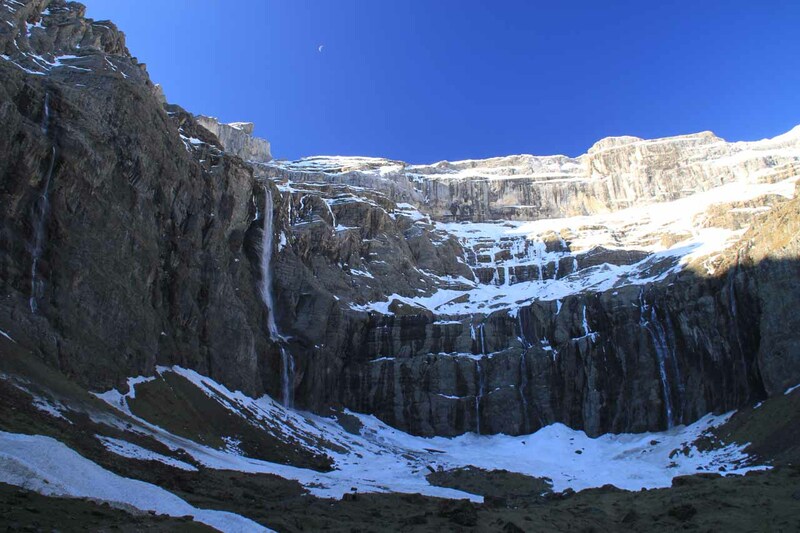 The waterfall sat in a glacial cirque, which I believe was a bowl or depression left behind by a glacier. 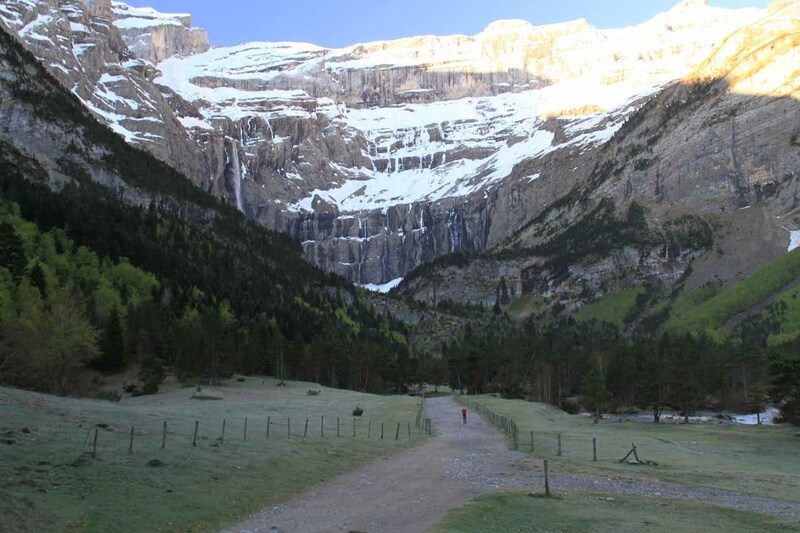 The result was what we believed had to be one of the most beautiful locales in Europe let alone all of France, because the cirque featured snow-crusted mountains with steep walls sprinkled with several small cascades including the reportedly 422m cumulative drop of la grande cascade itself. 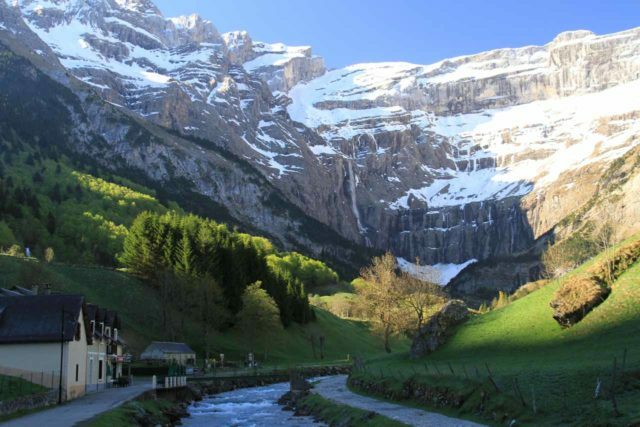 In fact, La Cascade de Gavarnie was said to be the tallest in the country. 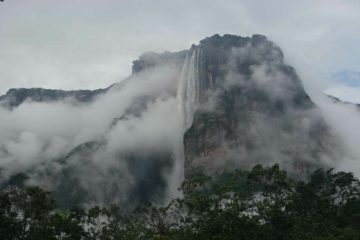 Of the overall drop, the tallest of its two most visible tiers was said to plunge 281m. 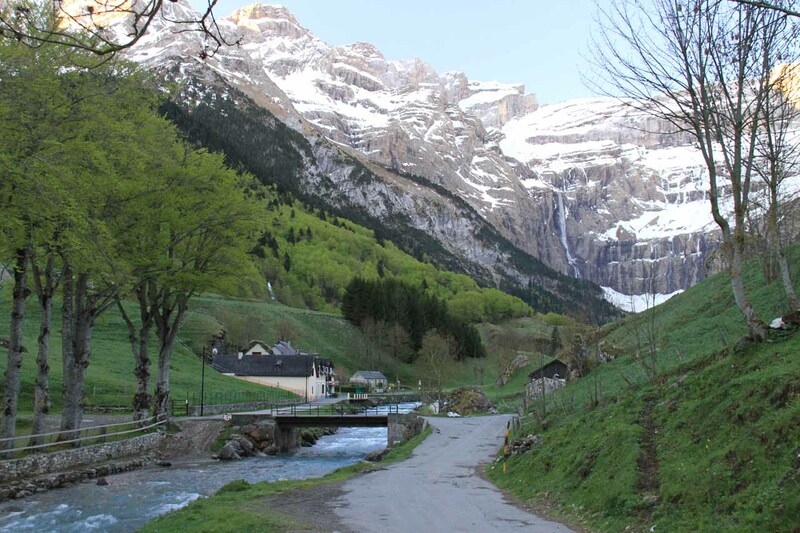 Le Cirque de Gavarnie resided right at the border of Spain and France deep within the Hautes-Pyrénées (Upper Pyrenees) department of the Midi-Pyrénées region. 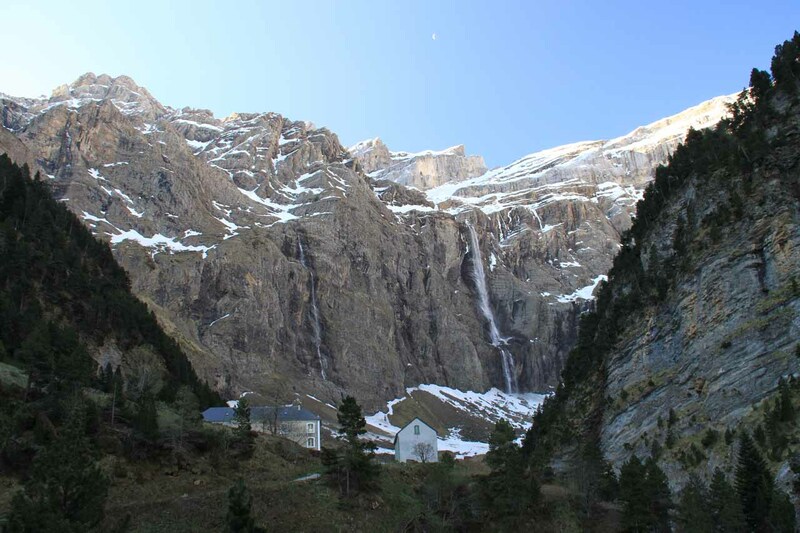 In fact, the glacial source of the waterfalls of the cirque was said to be on the Spanish side. Given its dramatic location, our experience with the falls and the cirque was totally at the mercy of Mother Nature. 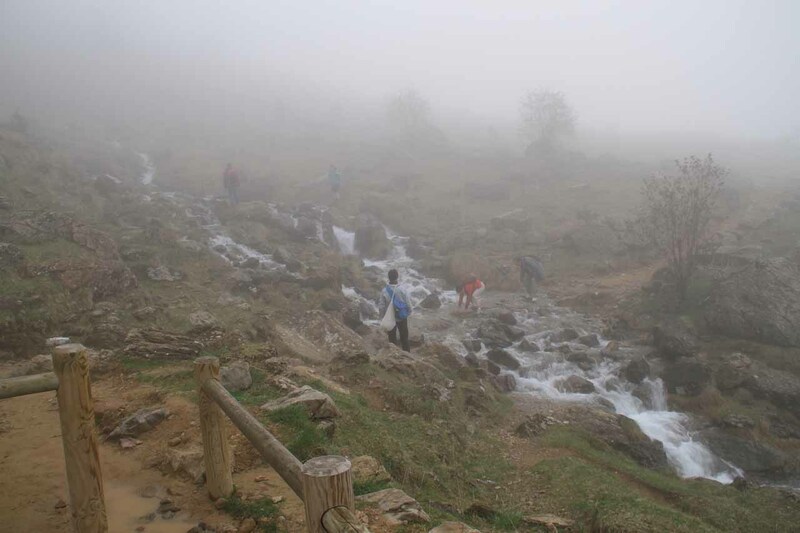 Basically, if il fait mal (the weather is bad), you may not be able to see neither the cirque nor the waterfall. This was exactly what happened to us on our first visit. 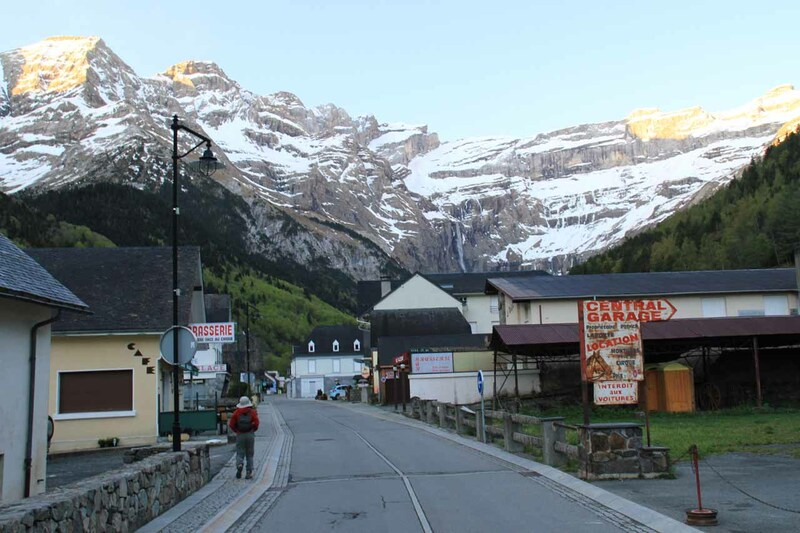 Luckily, we came back when the weather finally cleared and we could see the cirque and the grand waterfall from the neighboring town of Gavarnie! 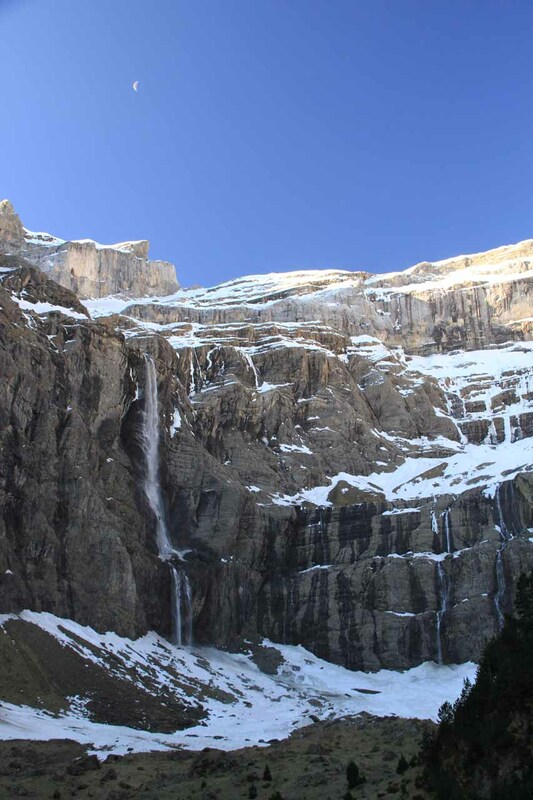 Even though both the falls and the cirque could be seen from afar, we thought it was well worth our while to do the roughly 2.5-hour round trip hike from town towards the nearby Hotel du Cirque et La Cascade (i.e. 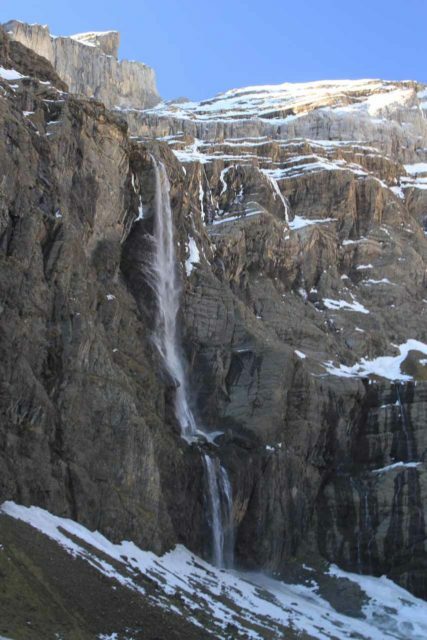 the Hotel of the Cirque and the Waterfall), which was the nearest structure to the base of the cirque and falls. 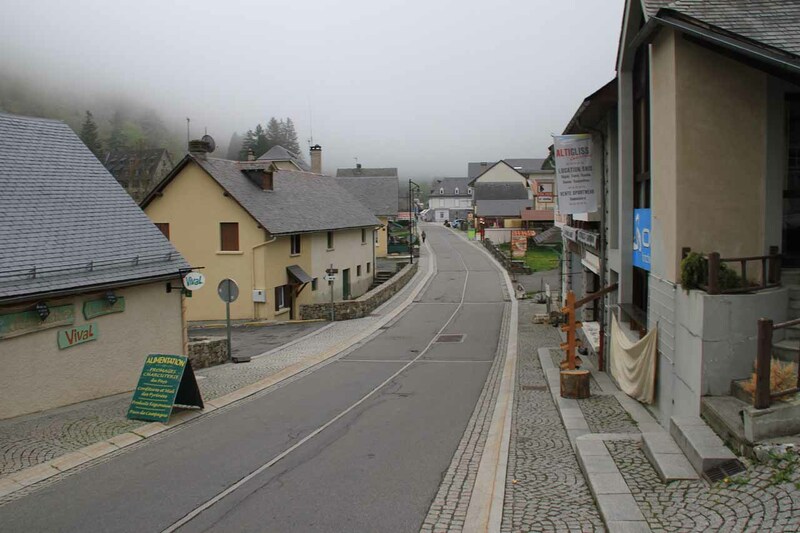 The hotel was closed during our visit, and I suspect that it would be open deep into the peak Summer season. 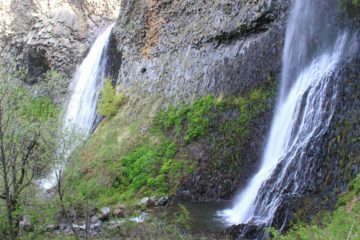 Yet through this hike, we were able to experience the grandeur of the scenery firsthand, especially since the pictures just didn’t seem to do this place justice as the photos on this website would attest. 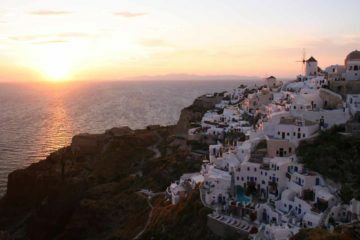 Speaking of pictures, we weren’t fortunate enough to be here when the lighting was best due to the combination of weather and circumstances. 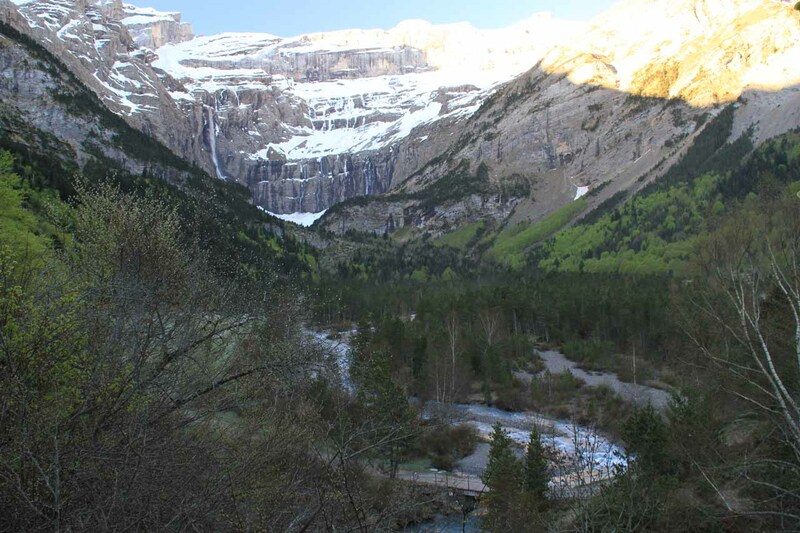 However, the most optimal time from a lighting standpoint would have to be late afternoon when the sun’s warm glow would splash right onto the Cirque and Cascade de Gavarnie themselves. 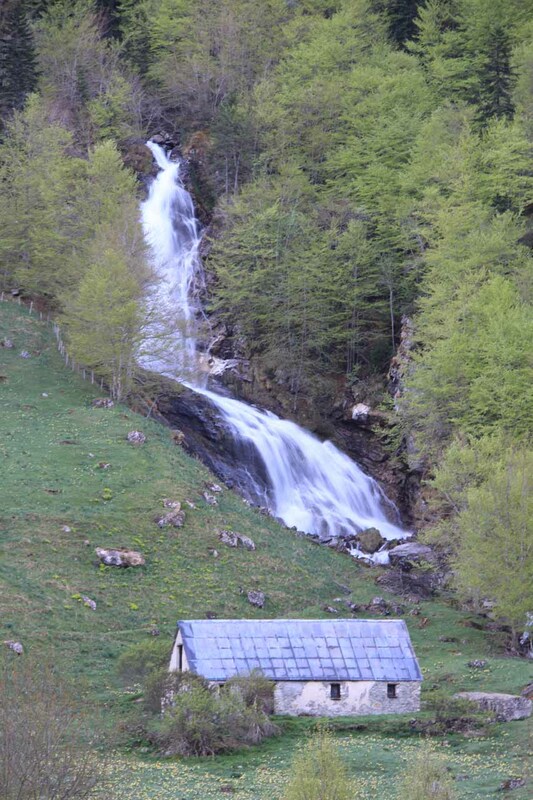 In any case, the trail followed both sides of the Gavarnie Stream while taking in a handful of surprise cascades along the way. The cirque was almost entirely visible throughout the trail though the perspective changed the further we went. 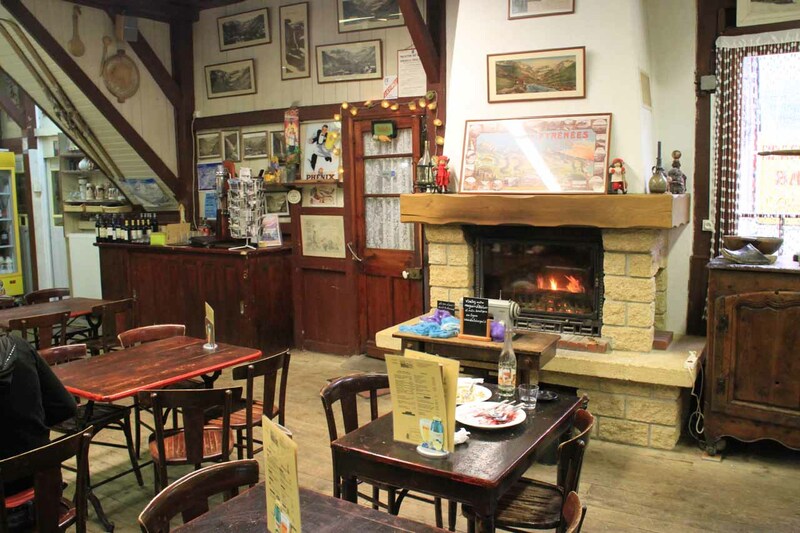 There were also a handful of cafes (they made excellent dessert crepe at L’Edelweiss) and souvenir shops where the town gradually gave way to Nature. Most of the trail was flat and developed as it was flanked with the buildings, farms, and residences with even a few sections of pavement and cobblestone. A couple of bridges allowed us to take our pick of which side of the Gavarnie stream to walk along. Once we got past the town, the trail ascended the first of two major uphill sections. It was here that the trail became mostly wide dirt road, which got progressively narrower the further we went. 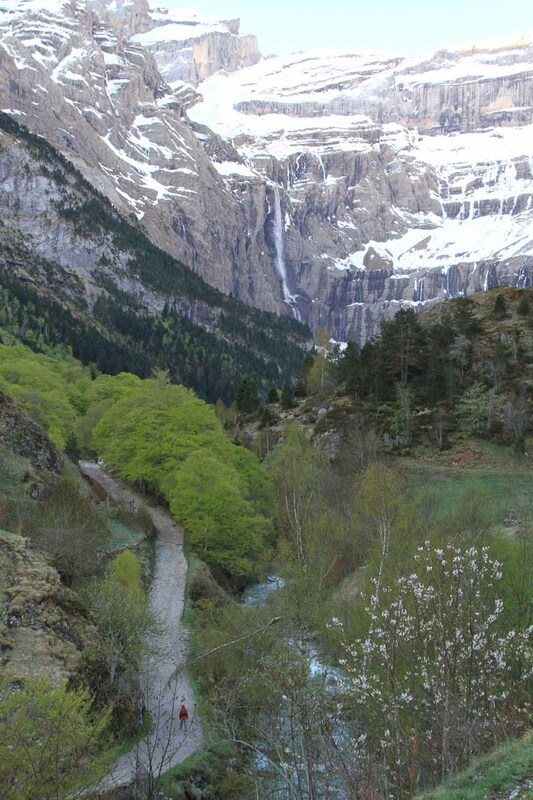 After briefly descending then traversing another flat area (a bridge here reconnected the split Gavarnie trails on both sides of the stream), the trail went up the second ascent. 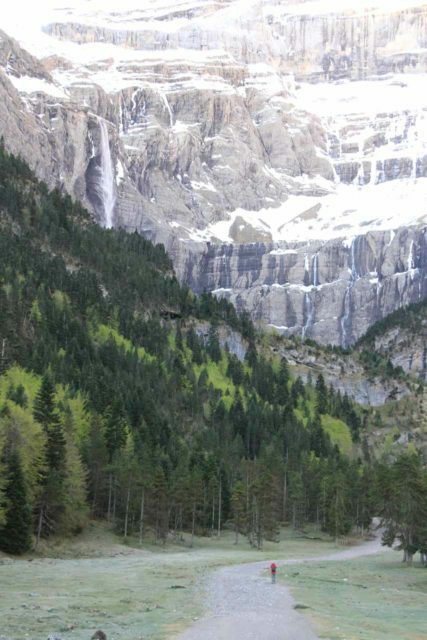 At this point, we followed along a gorge before it reached the remote Hotel of the Cirque and Waterfall. The trail up to this point was so tame that we saw plenty of families doing the hike (in both good and bad weather) though I didn’t recall any of them bringing infants. 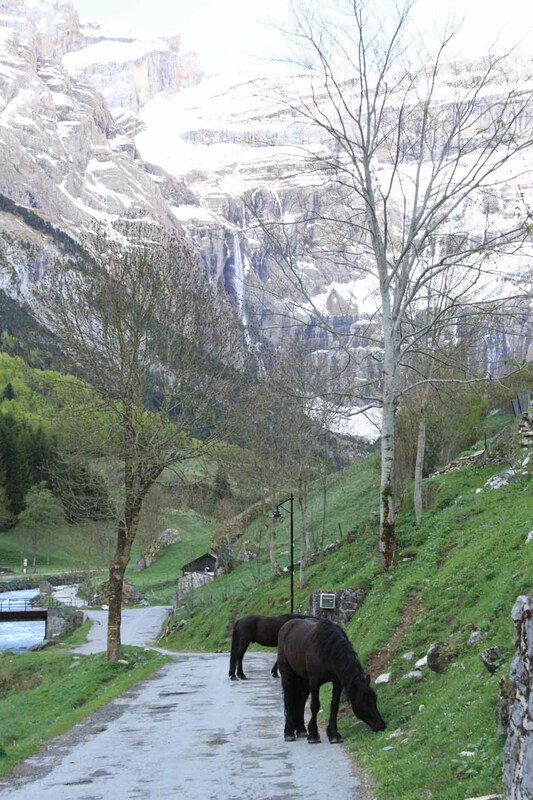 Once we went beyond the hotel, the trail narrowed even more and got a little more rugged as it continued to follow along a deep gorge carved by the Gavarnie Stream. Given the narrowness of the gorge and the imposing cirque ahead of us along with the rush of cascades and rapids below us, it got pretty loud here. In any case, this rugged stretch was very short. The trail then continued to go across a somewhat “scary” unbridged stream crossing. However, there were wooden planks present so I’d imagine there would be a bridge traversing this crossing later in the season. 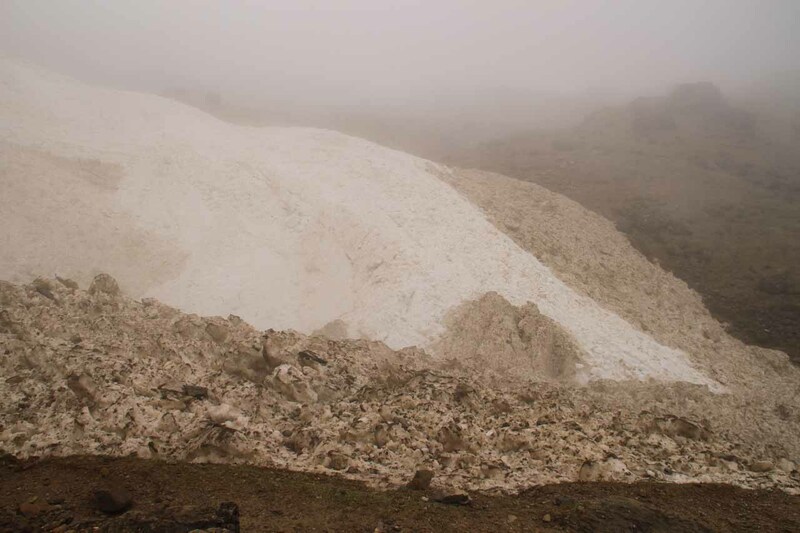 Anyways, with hiking sticks and/or Gore-tex hiking boots, the stream crossing looked worse than it really was, but the reward for going further was snow (la niege). 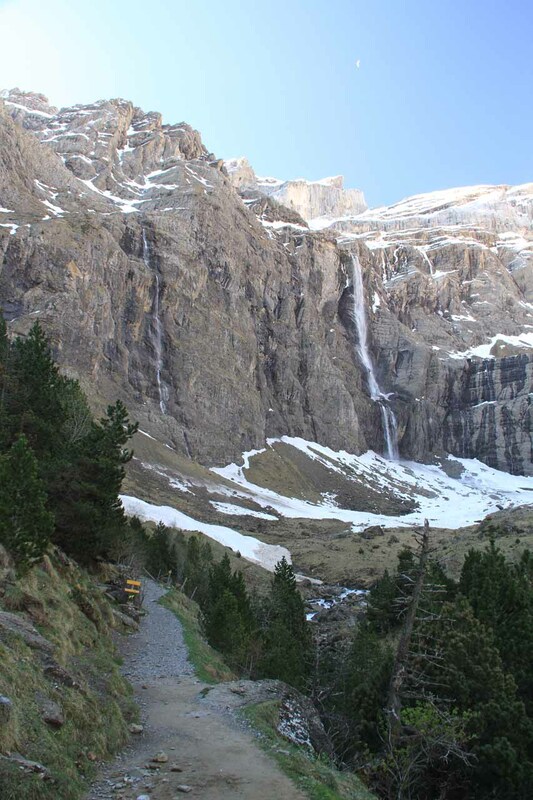 Personally, I wouldn’t recommend going further in the presence of snow due to avalanche and rockfall danger, but perhaps later in the season, the snow would be gone and it would be possible to go all the way towards the base of Gavarnie Falls itself! In summary, we felt this was one of those places where you have to let the scenery get into you (provided Mother Nature would be kind enough to reveal this treasure)! In other words, don’t be in a rush and allow yourself to be immersed. 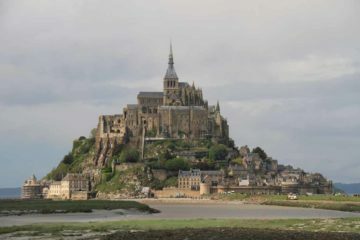 There’s only so much writing about this place that I could do and still inadequately convey the beauty and grandeur of this place. So just scroll down to see more pictures and movies. After all, you could be doing what we did and say, C’était féerique, when all is said and done! 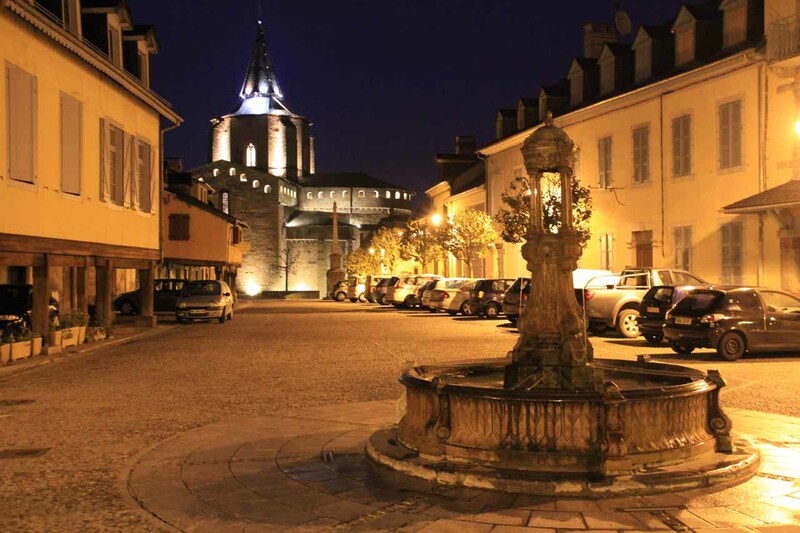 We drove here from the charming village of St-Savin along the D921. Even though it’s possible to do this drive in a half-hour (most likely if you’re a local who knows these roads like the back of their hands), you’re probably looking at something more like 45 minutes to an hour each way. This is because the mountain road is twisty and narrow. Unless you’re a real early bird, you’re most likely going to be following someone going slow anyways (especially since passing lanes are non-existent in this stretch and slow drivers pulling over at the few pullouts or shoulders seem to be more the exception rather than the rule). 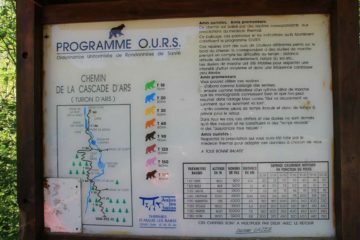 So plan on at least a half-day to do this excursion and even longer if you want to be more fully immersed in the experience of Gavarnie. 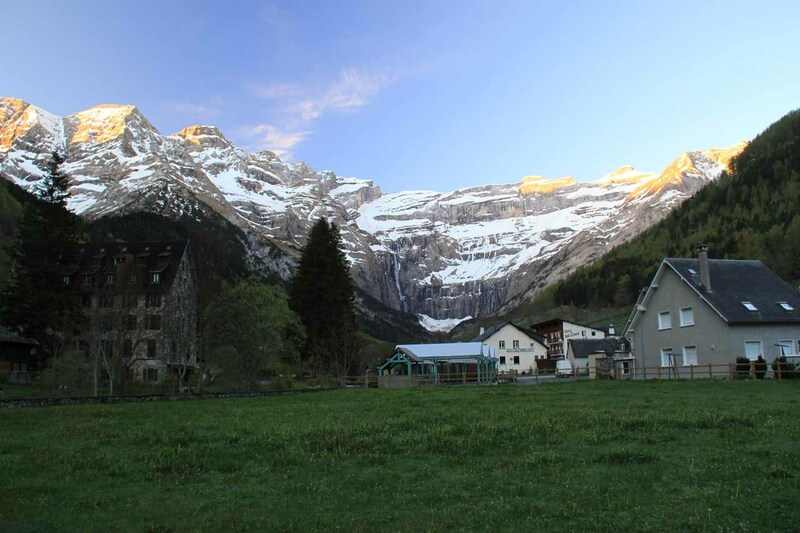 There is parking in the town of Gavarnie, but the free public lot is near the visitor center closer to the start of town (meaning it will increase the amount of walking you will have to do to even get started). Generally, the closer the car park is to the trail, the more you have to pay. However, there was one spot we noticed near a WC where some folks figured out no one was asking for parking money. 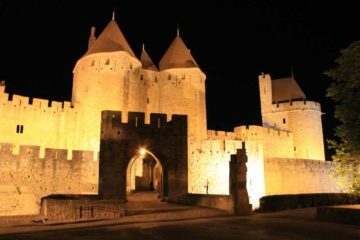 For geographical context, the town of Gavarnie was 35km (about an hour drive) south of St-Savin, 49km south of Lourdes, 224km (3 hours drive) southwest of Toulouse, and 754km (7 hours drive) southwest of Lyon.